In a double broiler, beat eggs and sugar. Add vanilla and milk. Mix well. Add flour, mixing well. Cook and stir until thickens (a little over an hour). 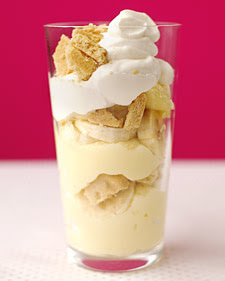 Pour pudding over layered bananas and wafers. Continue to layer. Serve warm or refrigerate and serve cold. (This recipe makes a lot! Reduce as desired).